Our storied pines are more than just pretty to look at: Historically, they produced the tar, pitch, and turpentine that made our state a key supplier of naval stores. The first European explorers knew they’d found something valuable just about as soon as they came ashore in North Carolina: Never-ending pines, most of them lean, towering longleafs. At more than 100 feet tall, the stands of longleaf promised plentiful resources for a seafaring age. 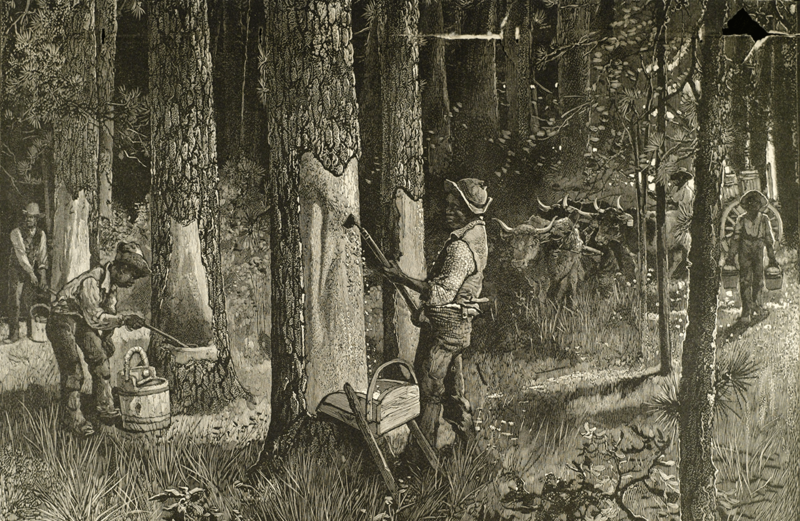 These were “trees which could supply the English Navy with enough tar and pitch to make our Queen the ruler of the seas,” two captains told Sir Walter Raleigh in 1584, writes Lawrence Earley in Looking for Longleaf. The seamen were referring to pine tar — a viscous fluid that leaks from heated pine, used to secure masts and sails — and pitch, or boiled tar, which could be heated and painted onto boats’ bottoms for waterproofing. Along with the pines’ wood, these products helped to foster a backwoods industry — and turned our state into the home of the Tar Heels. The nickname stuck, as one tale has it, when the gluey stuff met poor workers’ bare feet in farms and distilleries. Throughout the 1800s, North Carolina accounted for up to 96 percent of the nation’s “naval stores,” relying heavily on slave laborers, according to Timothy Prizer’s 2009 thesis “Pining for Turpentine.” The longleaf also yielded the sturdy beams that braced mills and warehouses, some of which still stand today. Yet neither the industry nor the longleaf could maintain its strength forever. Thanks to a combination of over-harvesting and ecosystem changes, the longleaf pine population shrank from 90 million acres in the Southeast to less than two million at the turn of the millennium. Of that sum, perhaps 500 acres in North Carolina is virgin, old-growth longleaf. Ubiquitous as pine trees are, it’s gotten harder to find our state’s favorite variety — but it won’t disappear. A small industry now harvests longleaf needles, and a conservation movement has emerged to ensure the land of the longleaf never loses its icon.